The phrase ‘one for the future’ is thrown around far too loosely in football lately. Why not ‘one for now’? Some of modern football’s greatest and most talented players were granted first team opportunities at an early age. 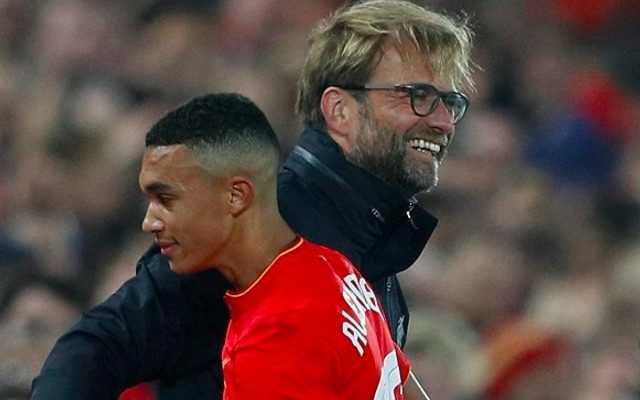 There obviously needs to be some caution over Trent Alexander-Arnold but the Liverpool youngster has shown enough to suggest he is capable of stepping into a first team role next season. His dominance in Monday night’s 2-0 win for the U23s over Chelsea has sparked excitement surrounding what he can offer, adding to the praise he has already received for his impressive performances for the senior side this campaign. The 18-year-old has a touch of everything in terms of the attributes required to be a top full-back. Pace, athleticism, energy and that bit of grit in his play. Jurgen Klopp will undoubtedly protect his man from any overwhelming hype but it will be difficult to diffuse the optimism completely. Reds fans have taken to Twitter to discuss the defender’s role. At least Liverpool don’t need to buy a new right back. Nathaniel Clyne and Trent-Alexander Arnold are good enough options for next season. Not sure is Trent Alexander-Arnold ready yet. Only time will tell I suppose, still only 18. Suits RB perfectly, has a crazy engine, fast and a good dribbler, decent height, just needs to work on 1v1 defending.